With his cross country performance at Cross Country race held in Nuwara Eliya last week Lionel Samarajeeva of Central Province is hopeful to represent Sri Lanka at the IAAF World Cross Country Championships to be held in Uganda on March 26. This was stated by Saman Kumara Gunewardena, Chairman Athletics Selection Committee, Athletics Association of Sri Lanka to the Sunday Times. Gayanthika Abeyrathne (Southern) who won the women’s race in Nuwara Eliya has indicated that she personally does not like to race in Uganda. She has said that her main target is the Asian Games. Her events are 800 metres and 1500 metres. She has competed in the Nuwara Eliya event because there were no racing events during that period. 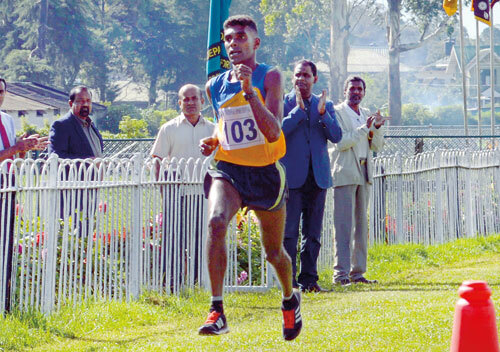 Lionel Samarajeeva of Central Province and Gayanthika Abeyrathne of Southern Province emerged winners of the Cross Country Race held in Nuwara Eliya in connection with the 42nd National Sports Festival. Samarajeeva clocked 33 minutes 00 seconds while Gayanthika returned a time of 38 minutes 33 seconds. Ninety men and 54 women competed for the Nuwara Eliya Cross Country. Men: 1. Central Province 2. Western Province 3. Uva Province.